“In the summer and fall of 1914, my grandmother, Margaret Sanger, nascent birth control advocate and a public health nurse in New York, wrote a pamphlet entitled, Family Limitation, in which she described various methods of contraception which she recommended to enable couples to plan, space and limit their children. It was this pamphlet that was translated into Spanish as La Brujula del Hogar and published in Merida in 1922. 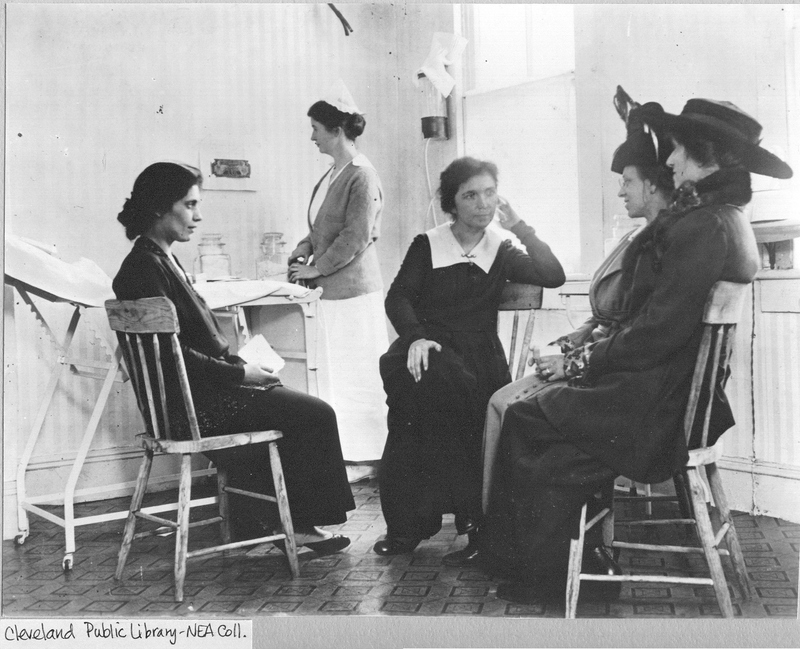 Sanger, her sister Ethel Byrne and Yiddish interpreter Fania Mindell counseling clients. 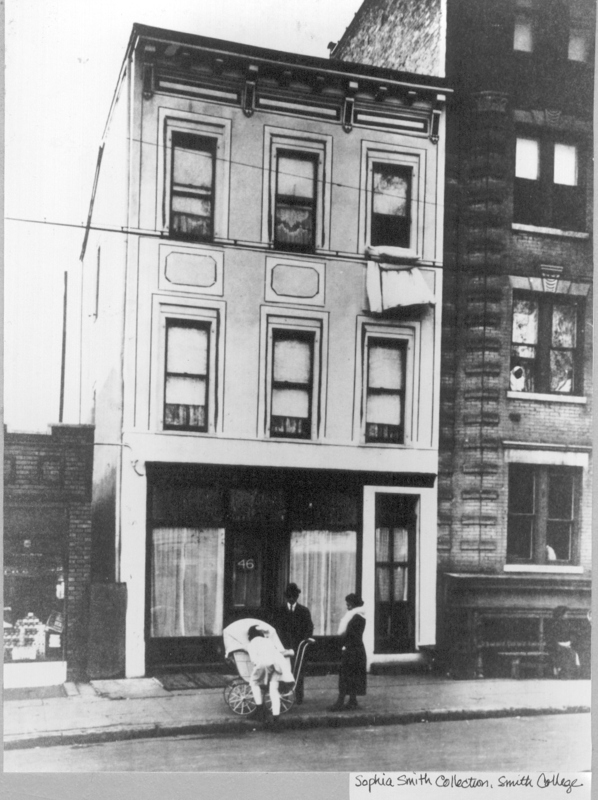 Sanger was arrested, tried, convicted and spent 30 days in the queens County Penitentiary. But she went on to lead a crusade to make birth control legal, safe, effective, inexpensive and available to all women regardless of race, religion or ethnicity. Can we still be struggling to ensure women’s reproductive rights 99 years later? Margaret Sanger began publishing the Birth Control Review in 1917 as a means to help build a birth control movement. By 1921 the monthly journal had become the official organ of the American Birth Control League, and included news of birth control activities, articles by scholars, activists, and writers on birth control, and reviews of books and other publications. The Review even included art and fiction in the form of cartoons, poetry and short stories. Karla K. Gower and Vanessa Murphree recently published “Making Birth Control Respectable” in American Journalism, an article that looked at underlying messages about eugenics and Neo-Malthusianism (overpopulation) found in the Review. To understand how eugenics and population were treated by the Review, it is important to understand the context in which the journal appeared. Gower and Murprhee argue that the topic of birth control was not publicly acceptable in the 1920s. Anything that related to reproduction was thought to belong in the private sphere. Public discussion of such matters made people uncomfortable. The Gower and Murphree argue that women were “relegated to the home” and were expected to uphold the virtues of the cult of domesticity–piety, purity, submission and domesticity. Thus, birth control was seen as taboo. Mailing information about birth control was also illegal, thanks to the 1873 Comstock Act, which made it a federal offense to send information about contraceptives in the mail. The Comstock Act also inspired states to further criminalize birth control. Gower and Murphree indicated that fourteen states prohibited the verbal transmission of information about contraception or abortion, while eleven others made possession of instructions for the prevention of pregnancy a criminal offense. But this did not stop Sanger and the American Birth Control League from mailing out the Review, though it probably had some impact the kinds of material the journal published. The main goal of the Review was to secure public support for birth control, to attract the support of doctors, legislators, academics, and the middle class and wealthy society women who formed the backbone of local birth control leagues. This is where the undertones of eugenics and Neo-Malthusianism come in. Sanger understood that there needed to be political accommodation in order to publish material on birth control. The Comstock Act, along with similar state laws, still existed. So Sanger and her supporters had to find a way to disseminate the information that they needed to without engaging in a full on battle with the law. The answer lay in appealing to a greater audience and breaking their belief that birth control was a taboo. This audience was the white middle and upper classes. But why would the BCR want to reach these classes? Were not most of the writings concerned with the impoverished classes, the women who could not afford to have undesired children? The answer was to make the club women, the women of wealth and intelligence, use their power and money and influence to obtain freedom and knowledge for the women of the poor. The women of leisure must listen. The women of wealth must give. The women of influence must protest. Sanger concluded that although it was working class women who needed the most aid, it was the “club women” who would have the necessary influence and resources to promote the birth control movement. for Sanger, eugenics wasn’t just a strategy. Eugenic theory developed in the United States during the early twentieth century. 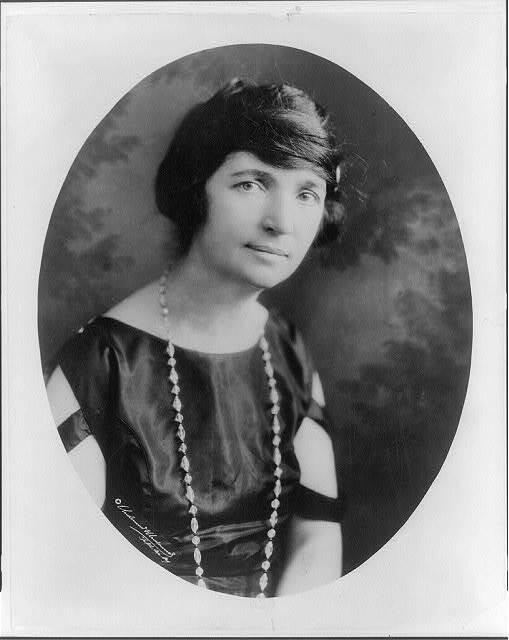 Individuals, including Margaret Sanger, believed that there were certain ways to promote a healthier population. Sanger, in particular, established ideas on when women should avoid giving birth. These ideas included women being at least 22 years old so that she can “attain a ripe physical and mental development” and when she is working since “society remains indifferent to the needs of her offspring and forces them to toil in mills and factories. 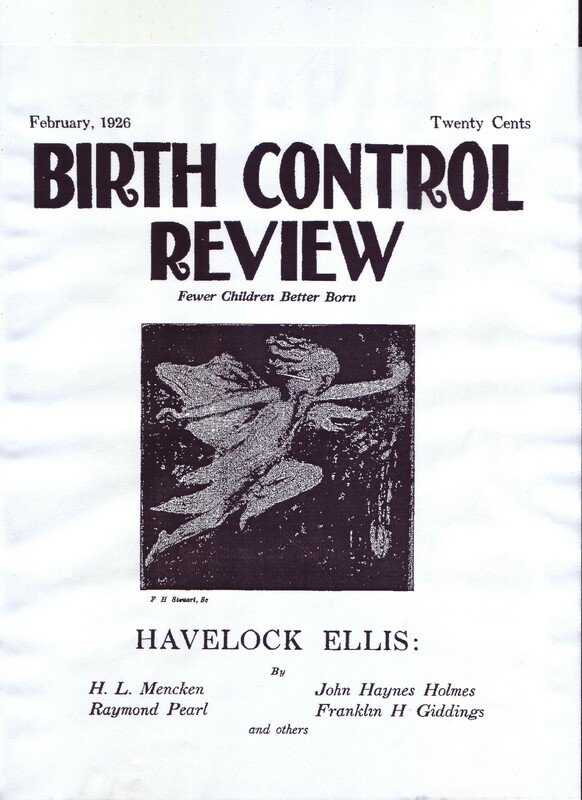 The BCR was a magazine serving as a publication to discuss the justifications of birth control. The upper class readers of these stories would have emotional reactions to reading the unfortunate stories and letters of poor women. By speaking to this audience, the topic of birth control would be public and legal with social changes could come to fruition. What this audience tended to want to hear during this time were discussions on eugenics and Neo-Malthusianism. These topics concerned the strengthening of gene pools and the controlling of overpopulation, respectively. More importantly, the supporters of both were concerned with quality over quantity. Quite. Think about the BCR and the birth control movement in general. The primary goals included decreasing the number of undesired births in poorer populations in order to improve the quality of life for the poorer families. Now, Sanger and the BCR editors had to be careful about using eugenics to further promote birth control in the public sphere. The idea was not to make greater white middle and upper class families, rather, the intersection of these movements was to support the idea to ensure that families had the right to control the size of their family and that women had the right to control their bodies. Cover of the BCR published in February 1926. Slogan, “Fewer Children Better Born,” suggests that birth control would lead to a healthier population. In addition to addressing the question of increasing an “unfit” population, there was the question of overpopulation. Neo-Malthusians supported using scientific advancement, in this case birth control, to impede the growing world population as it was assumed to be constrained by inadequate food production. Sanger, after hearing a speech given by Frank Vanderlip concerning the growing population of Europe and their possible reliance on American food sources, saw the potential in incorporating this argument in the birth control movement. So you see? Both the incorporation of eugenics and neo-Malthusian ideas were also communication tactics! Sanger effectively used the appeal of the eugenics and overpopulation movements to further the birth control movement. What was the BCR able to communicate with these associations? Everything converged to demonstrate that birth control would give women the liberty to control their bodies and therefore, control the number of children they had. This would naturally lead to a healthier population. Everyone would hopefully be content. Gower, Karla K. & Vanessa Murphree. “Making Birth Control Respectable.” American Journalism 30,2 (2013) : 213. McFarlane, Deborah & Kenneth J. Meier. The Politics of Fertility Control. New York: Seven Bridges, 2001, 30. Gower, Karla K. & Vanessa Murphree. “Making Birth Control Respectable.” American Journalism 30,2 (2013) : 219. Birth Control Review, June 125, front cover. 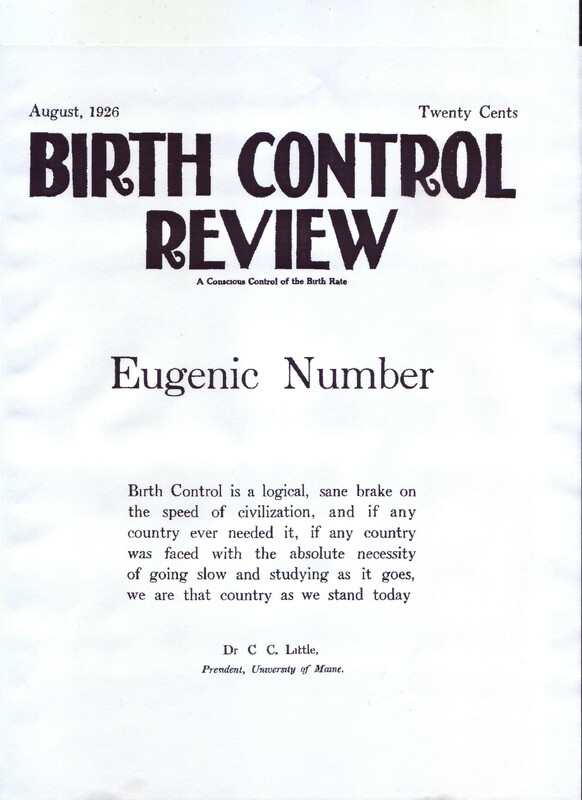 “Birth Control the True Eugenics–Mothers Who Refuse to Bear Unfit Children,” Birth Control Review, August 1926, 248. Gower, Karla K. & Vanessa Murphree. “Making Birth Control Respectable.” American Journalism 30,2 (2013) : 233. Margaret Sanger Arrested in Portland! The Morning Oregonian, June 1916, advertising Sanger’s upcoming appearance at Heilig. On June 30 and July 1, 1916, newspapers across the country publicized Margaret Sanger’s arrest in Portland on June 29. Along with Sanger, Dr. Marie Equi, Mrs. Florence A. Greatwood, and Maude Bonner were also arrested, and the papers noted that “several other women clamored to be arrested on the same charge.” The meeting itself had attracted a substantial crowd. Bail was set at $25, but Mrs. Greatwood was the only one who accepted it. The other three women spent the night in jail and remained there on June 30, pending a hearing. After conferring with a lawyer, the women decided to demand a jury trial. Judge Langguth postponed his decision until Friday, July 7. On July 5, the Morning Oregonian invited the public to a “Margaret Sanger rally” to be held at the Spiritualist Temple, with several speakers, including Sanger herself. The following day, a lengthy article covered the meeting, at which Dr. Chapman bemoaned Portland’s “medieval, inquisitorial, petty-minded mediocrities” of city officials. Sanger argued that “if two people behave at all in the marriage relation, they must have knowledge of the methods of preventive of conception.” And, of course, before the police “moral squad” arrived, copies of Family Limitation were for sale to attendees. On July 7, Judge Langguth found the defendants guilty of distributing obscene and indecent material. His decision rested on the “assumption that matter not necessarily obscene when offered for sale in bookstores, or for use in medical clinics, becomes obscene when circulated publicly if it is of a nature calculated to excite lascivious thought in youthful minds,” according to the Morning Oregonian’s coverage. The men were fined $10 each but not required to pay, and the women were not fined at all. 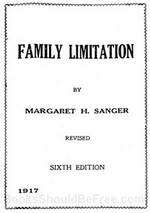 Later, in her 1938 Autobiography, Sanger noted that “the papers made a great to-do about the affair but it was not a type of publicity of my choosing and did little to bring the goal nearer.” However, the publicity did lead to an increase in demand for copies of Family Limitation. 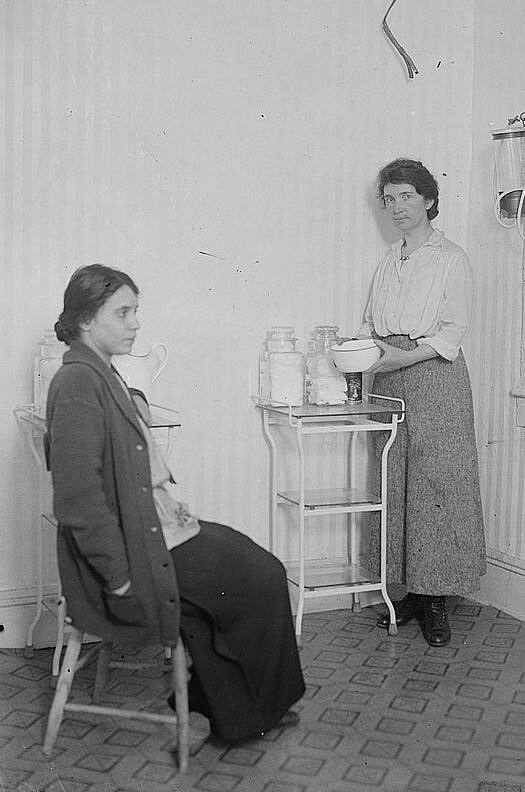 Dr. Marie Equi, who was also arrested, met Sanger in Portland earlier in 1916 and helped her to revise Family Limitation. In addition to her work as a physician and providing abortions, she was active in the radical labor movement and the women’s suffrage movement, as well as fighting for protective legislation for women and children. For news coverage of the events of June and July 1916, see, among others, “Book Sale Stopped: Council Act Brands Mrs. Sanger’s Pamphlet as Obscene, Criticism Induces Action,” The Morning Oregonian, Portland, OR, June 24, 1916; “Mrs. Sanger Arrested, Three Other Women Also Held for Holding Meeting of Protest,” Altoona Mirror, June 30, 1916; “Mrs. Sanger Arrested,” The Morning Echo, Bakersfield, CA, July 1, 1916;“Sanger Cases are Now Up to Court: Concluding Arguments Compare Book with Others to be Found on Sale, Law Declared Absurd,” The Sunday Oregonian, July 2, 1916; “Margaret Sanger Rally is Tonight,” The Morning Oregonian, July 5, 1916; “Officials are Hit: Sanger Protest Meeting Brings Roast for Mayor, Others Called Names,” The Morning Oregonian, July 6, 1916; and “Mrs. Sanger’s Book Declared Obscene,” The Morning Oregonian, July 8, 1916. On Dr. Marie Equi, see “Changing the Face of Medicine: Dr. Marie Diana Equi,” at the U.S. National Library of Medicine. Also see MS’ article in The Malthusian, September 1916, pp. 83-84, MSM S1:638-640, and MS’ Autobiography. For a summary of Sanger’s eventful 1916 tour, see Sanger, “A Birth Control Lecture Tour,” Aug. 6, 1916. Ninety-one years ago, Margaret Sanger and the newborn American Birth Control League scored a publicity coup when, on the request of New York’s archbishop Patrick Hayes, the New York City police department suppressed a public meeting on birth control. This event put the birth control movement and its leader on the front pages of New York papers and won the support of many of New York’s liberal elite. The Town Hall raid serves as an example of how Sanger’s media prowess turned what could have been a crushing blow for the new organization into a public relations triumph that featured the hubris of a Roman Catholic Archbishop. 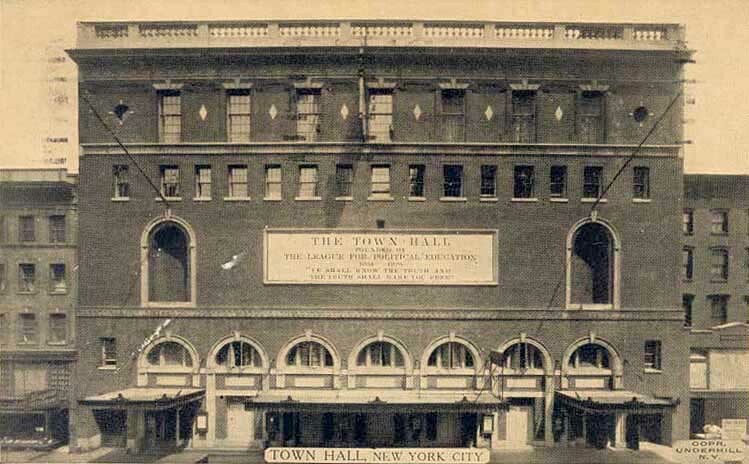 The Town Hall, at 123 West 43rd Street, was opened in January 1921 by the League for Political Action, a pro-suffrage group, as a venue for educational meetings, lectures, concerts, and poetry readings. Sanger had booked the hall for the final session of the First American Birth Control Conference (held November 10-13), an historic gathering of prominent scientists, physicians, demographers and eugenicists, as well as social workers, birth control advocates and socialites. During the first two days of sessions, the attendees discussed the global ramifications of birth control and its potential to lessen the major social ills of the world at the Hotel McAlpin. The conference also launched the American Birth Control League (ABCL) to promote birth control through education and lobbying. With astonishing directness Roman Catholic Archbishop Patrick J. Hayes, through his emissary Monsignor Joseph P. Dineen, closed the meeting before it even opened. We had grown accustomed to opposition, from the combination of the Comstock group even after his death, with the Roman Catholic hierarchy, but never had the interference been so brutally direct before. Time and again theatres, ballrooms where I was to speak were ordered closed before the meeting could be held. In city after city this occurred during the years, 1916, ‘17 and ‘18, but the climax was the now famous Town Hall incident which raised the issue throughout the country. Sanger managed to get inside Town Hall when the doors were opened to let members of the audience leave. I wedged my way in a side entrance under the arm of a protecting officer who mistook me for one of the “press.” Harold Cox had by this time managed to reach the platform. An officer barred the platform steps to me. Harold hauled me up beside the steps, grabbed a bunch of flowers from a bewildered messenger boy and shouted to the audience, ‘Don’t leave! Here’s Mrs. Sanger,’ thrusting the flowers which were to have been presented as a grand finale into my hand. The vast audience, many of them important doctors and scientists, who had begun to leave their seats, returned. I began to talk but could not be heard. Ten times I tried to speak forcing the police finally to do what I wanted, deny me the right of free speech by arresting me. The incident escalated when the press reported that New York Archdiocese had pressured the police to shut the meeting down. 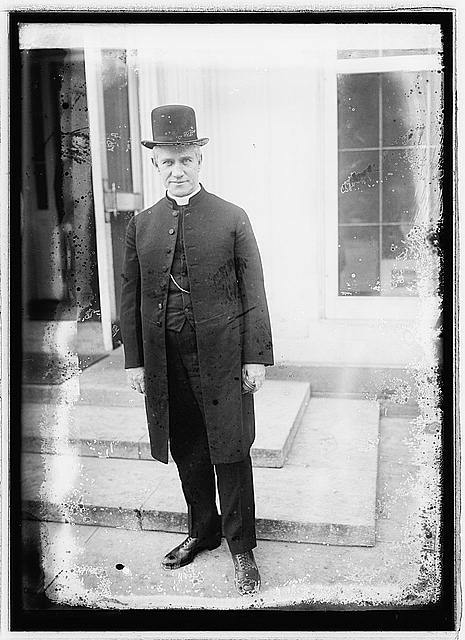 A representative of Archbishop Patrick J. Hayes telephoned police headquarters shortly before the meeting, and the Archbishop sent his secretary, Monsignor Joseph P. Dineen, to meet with Captain Donahue. Sanger had invited Hayes to the meeting, hoping that a Church official would rebut her claim and provide good fodder for the press. She may even have hoped that her invitation would stimulate Church interference. 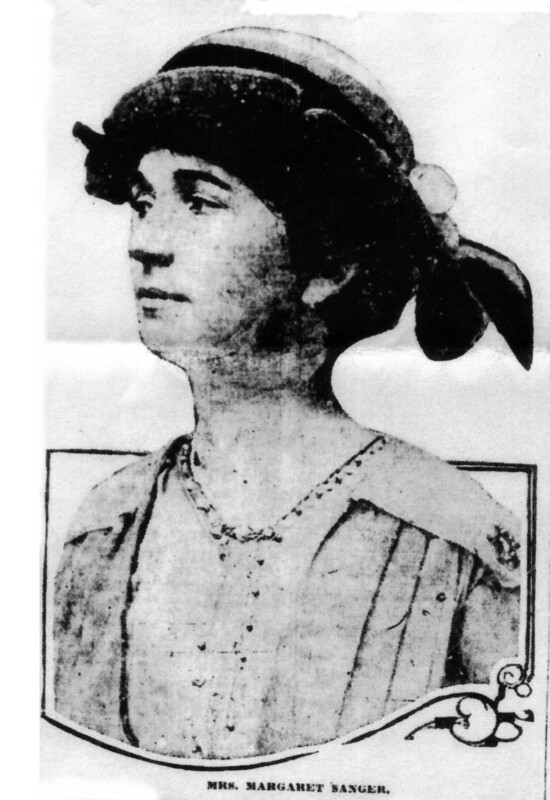 Dineen defended the suppression in the daily papers: “Decent and clean-minded people would not discuss a subject such as birth control in public before children [he claimed four children were present at the meeting; they turned out to be four Barnard College students with “bobbed hair and short skirts”] or at all.” The police action was necessary, he added, because birth control “attacks the very foundations of human society.” (New York Times, Nov. 15, 1921) Archbishop Hayes issued a statement a week later claiming that “The laws of God and man, science, public policy, human experience are all condemnatory of birth control as preached by a few irresponsible individuals. . . .” He then referred to the recent Eugenics conference in New York as evidence of a scientific repudiation of birth control, as it promoted the fertility of the “better born.” He even went so far as to recite a startling anti-Christian, eugenic directive that “more children from the well-to-do” was a “moral duty.” (New York Times, Nov. 21, 1921) Although Dineen and Hayes admitted that a call was placed to the police in opposition to the meeting, they refused to acknowledge their power to guide or manipulate the police department. The mass meeting to discuss “Birth Control – Is It Moral?” was rescheduled for November 18 at the Park Theater. Once again Sanger invited Archbishop Hayes, along with Catholic University sociologist, Monsignor John A. Ryan, and John Sumner, head of the Society for the Suppression of Vice. Only Hayes sent a representative. The meeting took place without incident. What did Sanger take from her victory? We had the hierarchy to thank for so publicizing our meeting that the second held shortly after, at the big Park Theatre in Columbus Circle was packed fifteen minutes after a single door was opened. Two thousand people, many of whom had never heard of birth control before Cardinal Hayes gave it nation-wide publicity, stood outside clamoring to get in, even climbing up the fire escapes. Orators were haranguing from soapboxes, men were pounding each other with their fists. Paulist fathers sold anti-birth control pamphlets. The hierarchy had turned a simple unheralded meeting into a cause celebre, giving our movement more publicity than it could have acquired in years of proceeding simply and scientifically on its way impeded.